… with all the Christmas music playing and Christmas decorations displayed in the stores. The reminders to post our overseas Christmas cards and gifts early (oops- I already missed the economy mail deadline for Australia – that’s gonna cost me!). And also, all the Christmas romance boxed sets launching! I love Christmas, though as I’m married to something of a Grinch, I don’t decorate till a few days before the Day, and we tend to keep things simple. A few evergreen branches, and as many twinkling Christmas lights as my Grinch will let me get away with! I love Christmas shopping, not the stress-fueled last-minute rush in the stores grabbing anything that will do, but seeking out what I hope are just the right gifts to bless the people I cherish, all through the year, and tucking them away. I love Christmas stories, both reading them and writing them, especially when the stories include the real meaning of Christmas. I like to see a bit more than what many Hallmark movies or Christmas books show as the “real meaning of Christmas”. Those books and movies can be wonderful, but usually focus on human love, reconciliation, and forgiveness. The secular world tends to ignore the even more important Love that came into the world at Christmas. God’s Love made flesh in His Son Jesus. A Love that doesn’t end with a baby in a manger or three wise men. That doesn’t end when the tree is taken down and all the decorations are put back in the attic for another year. A Love that inevitably leads to the cross, and the most important reconciliation and forgiveness of all. The thing that disappoints me about most Christmas Romances (any medium), is the underlining conclusion that: “Relationships, not things, make Christmas Special”. That is really only partially true. It doesn’t go far enough. Christmas celebrates the Birth of Jesus Christ, God’s Gift to mankind. He came as promised, the Messiah, God in human flesh! All the things mankind has attached to the Christmas Holiday, will pass away eventually. But accepting a relationship with Jesus is the only gift that will last forever! That’s the Whole Reason we Celebrate Christmas! So true! Thankfully, there are plenty of Christian authors writing Christmas romances that emphasize God’s Love, the Love that gives Christmas its meaning, as well as the love between a man and a woman. The Inspy Romance authors have produced quite a few Christmas sets this year! You will have already seen posts about and maybe even already read the sets Ginger Solomons’s writing group put together, The Heart of Christmas, and the Inspy Romance eight-book set organised by Kimberly Rose Johnson, A Christmas to Remember. Some truly wonderful stories in these sets! Other Inspy Romance authors have released solo sets this Christmas, mosly incuding previously published books. Alexa Verde put together three lovely full-length romances in her In Love by Christmas set. 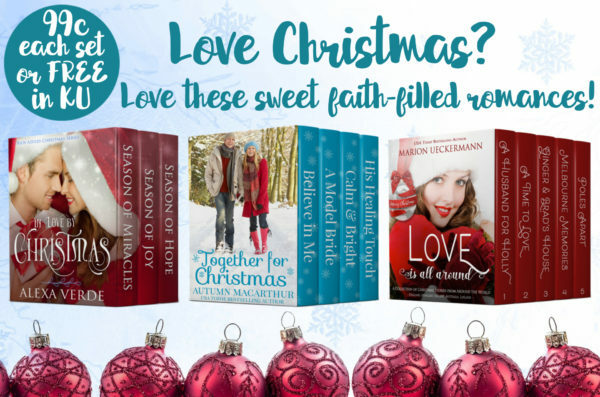 And Marion Uecekermann collected her five Christmas books into the Love is All Around set. And I also did a Christmas set this year, launched two weeks ago! I wanted to release a set with a book from each of my four main published series, but I had a problem. Sweetapple Falls only had one book so far, set in spring. I really didn’t have time to wite a whole new book, unless it was just a short story. Then God nudged me with a solution. I had a novella that became unpublished earlier this year when Kindle Worlds closed. Another spring story, and set in Texas, not Oregon. Could I really move the story across the country, change the season, change many of the secondary characters, and change the faith message from Easter to Christmas? I’m hoping readers think I managed it! Certainly, an extra four chapters came from somewhere. It turned out the easiest part to revise was the faith message. The baby King laying in a manger who the wise men came to worship, the King who entered Jerusalem in triumph on Palm Sunday, and the King who died on a cross for us are the same King, no matter what time of year it is. Without the cross, there is no gift in Christmas, no blessing for humanity in Jesus’s birth. In His Healing Touch, currently available only in my Together for Christmas boxed set, that’s a lifechanging realization for my heroine Lainie. As it was for me. What’s your favorite theme for Christmas stories? One commenter on this post before November 18 will be randomly chosen to win the choice of my ebooks. And I’m so sorry if I missed other new Christmas sets from any of the authors here. Please feel free to share a link in the comments if I did! For me and my family, Christmas is very much about celebrating the birth of Christ- so my favourite Christmas books celebrate this. It’s crazy how early those decorations go up! I once worked in a retail centre, and the Christmas music started Nov 1 and wen’t right through to January 1. We were so sick of those 20 songs after having them repeat on endless loop for eight hours a day! And of course, they were all secular Christmas songs, too! You are so right, Wendy. Christ is the heart of Christmas. Take Him out, and it’s nothing. Hi Autumn! In the Midwest stores are getting ready for Christmas. Went to Aldi and purchased my first Christmas Stollen (German fruit bread). I have been watching Hallmark Christmas movies. Been reading lots of Christmas stories by all the wonderful Inspy Romance authors and some others. So many great stories filled with spiritual truths and the real reason for the season. Even the weather with its howling winds and dusting of snow is preparing northerners for the season. Decorations in house are put up after Thanksgiving with the beginning of Advent, which this German celebrates in preparation of Christ’s birth. We have an advent wreath (our first holiday decoration) with four red candles, each Sunday a new one is lit – Candle of Hope, Candle of Preparation, Candle of Joy, Candle of Love, and Christmas Eve the Christ Candle. That’s a wonderful tradition, Renate! Valerie did a series on the Christmas candles in her Sunday Editions last December. I enjoyed reading it so much, because it’s a tradition I wasn’t familiar with. We probably won’t see any snow here till it’s almost Christmas, and maybe not even then. But it’s certainly chilly enough to feel that winter is near! I’ve never eaten stollen, but I saw it in ALDI this week and considered getting some. I love how every country has its own variation on festive foods. Autumn! The Aldi butter stollen is our family’s favorite. The Marzipan (almond paste center) is an acquired taste and I am not fond of the cherry variety. Like the raisins and citrus in the butter stollen – that is the way my mom made it. Nice to hear that the United Kingdom has Aldis. We do have Aldis here. It’s one of my favorite stores. There are Aldi stores in Australia, too, and my family usually shop there. Hmm, I am definitely going to have to try stollen this Christmas. And after reading the comments from you and Anke, next Christmas, I need to make one of the main characters in my Christmas story of German ancestry, so they can keep the Christmas traditions! Good morning, Autumn! Everywhere I go I see Christmas decorations started earlier and earlier….sadly it’s to generate more shopping. I would be totally okay with the early decorations if it was to celebrate the birth of Jesus and not to make people want to shop more! At my office they decorated yesterday…..hut we are not retail and they are all very much about the reason for the season, so I can live with that….lol. I am so grateful for our Lord, so I will enjoy the early decorations! I have read all of your stories, and the others you mentioned… I highly recommend them to everyone! Thanks so much for your book recommendations, Paula! There are so many wonderful Christmas stories from Inspy Romance authors this year! And nice to work in a Christ-honoring environment. I love presents and food, but all the “Buy buy buy,” “Shop shop shop,” and “Eat eat eat” gets a bit exhausting. Not to mention leaves the Reason for the season completely out of the Christmas equation. When kids think it’s Santa’s birthday, something is wrong! Yes! Totally agree with you! It snowed here yesterday, so suddenly I’m in the winter spirit, if not exactly Christmas! We won’t decorate until December in our house, which sometimes means I miss out on deals on decor. Thanks for the reminder to pick up some new light strings when I’m downtown this week, before they’re all gone (like last year). It wasn’t like I totally planned when to write it! It just worked out that way. The downside was that it gave me a long stretch with no releases and then two back-to-back. Oh, well! Except I’m guessing they were in different series? I have a crazy hope to write and release 9 books in 2019. Only two are actually in the same series, and they’ll be nine months apart. LOL! LOL, that’s a good reason, Kimberly. Love it! We do too! Hubby and I try to watch A Christmas Carol every Christmas Eve if we can. The Patrick Stewart version is most true to the original story. I just finished E. Maddrey’s Hope for Christmas in the A Christmas to Remember box last night, so grateful it was “all about Jesus” :-) Wonderful. Thank you, Lord. I’ve peeked into your box (the one you gifted me with recently) and am looking forward to (really) reading His Healing Touch (I had read the other books already, as I’ve got all of your books). I’ve never had a Christmas tree of my own, although my parents always have for the past 47 years. And it never goes up until Christmas Eve. Not sure how many Germans put up their tree before it’s actually Christmas. Although they do have candles and other small ornaments around the house. Some, I believe, have started to hang up mistletoe, probably because they find the (Hallmark-inspired?) idea of being kissed under one romantic. I pull out some ornaments as well. And I’ve got one of these, http://bit.ly/2JVrhAr, a “Schwibbogen” (the 2nd part of the word “Bogen” means arc or arch due to it’s form). A gift from my parents. It will sit on my window sill throughout December, and maybe January. Some of them have Christmas scenes, others just winder landscapes. Elizabeth is a wonderful writer whose story are always faith-filled! I haven’t read it yet, but I’m sure her story in the set is wonderful. I hope you enjoy His Healing Touch, too. Thanks so much for introducing me to something new! I’ve never seen a Schwibbogen before. Here in England there is something similar, but it’s just the arch with the candles or more often, electric lights. No wonderful winter scene! I hope your Sunday was beautifully blessed. It was, seven adults were baptized and we ate together afterwards to celebrate! Glory be to Yeshua. We put one tree up around Oct 20th. We usually only have one tree, but this year I decided to put one in the family room and the living room, plus a small one in my office. The one we put up already is in the family room. It’s a slim tree, so barely takes any space and we decorated it rustic with burlap deer and glittery antlers. Christmas frustrates me somewhat. People either make it about gifts, kindness, or Santa. The nonbelievers who do acknowledge Jesus’ birth seem to want to leave him in the manger. It makes me want to run through the streets shouting – Hey, you’re missing the point. It’s about Jesus!!!! And He’s not a baby anymore!!!! He wants to be your savior!!!!! So true, Shannon! I totally get that feeling of wanting to shout “He’s not a baby anymore!” Leaving Him in the mager is missing the entire point! No, leaving Jesus in the manager is not missing the point for all of us. He is in a feeding trough, because he is our food. He comes to us as food in the Eucharist, a gift he gave us before he began his journey to the cross. His helplessness as a baby reminds us of his helplessness on the way to Calvary and on the cross. One tradition every Christian should adopt for Christmas is a lot birthday cake. And singing happy birthday to Jesus. It is a very pointed reminder of why we are celebrating. I enjoy the hallmark type stories, the true meaning of the season, and the joy. Not the pressure to buy, although I may go a little crazy as it is my first grandson’s first Christmas. Those are such good points, Helen! Things I hadn’t considered significant before. Amazing how God pays attention to every tiny detail! But words words prove exactly what Shannon and I meant by our comment. You’re not focusing solely on the cute part of the story there, the newborn baby, but the whole continuum of His life through to risen Lord. By “leave Him in the manger” we meant the secular viewpoint that focuses just on Christ as a newborn in the Christmas story, and makes Easter about more cuteness. Bunnies and chicks, not an agonizing death after torture, followed by a triumphant resurrection, to save all who call on Him. We don’t do the birthday cake in our household, but we do sing “Happy Birthday” to Jesus. It’s a great reminder of whose birthday we’re really celebrating. It does feel like Christmas already (though I feel it’s too soon). I do love Christmastime, but it scaries me to think the year is over and there were so many things I didn’t accomplish. My husband and I were talking this weekend that we moved to our new place January 15th, but it honestly feels like it was 3 months ago, because we barely finished all the things we thought we’d finish 3 months into the new place (like buying any sort of light fixture other than just lamps hanging from a ceiling whole), getting a bathroom cabinet, and so on..
It’s Christmas and it’s the time to celebrate Christ birth, so we’ll put that on the shelve for another year and visit with friends, bake cookies, and just enjoy our son’s second Christmas. I enjoy Christmas stories just like any other story and I think your post made me realize why: they are not any different than romance any othe time of the year. They focus on relationships, not Christ. So when love happens doesn’t make a difference for me, though I really enjoyed reading Believe in Me and it would not have worked any other time of the year. Maybe we could say the same for Calm and Bright? I’m glad that rather than feeling bothered by the things not yet done, you’re going to enjoy the celebration, Priscila. Your son is at a wonderful age! You’re right, Believe in Me really can’t work shifted to any other time. And A Model Bride does need to be New Year, too. My other Christmas books? Probably not so much. Though to me it feels right for them to happen at Christmas, especially Calm & Bright, it’s not so integral to the story. A week or two revising, and they could happen at other times of year. Amazing post! So true what you said about the true meaning of Christmas. And thank you so much for the shout out! Happy to share your lovely Christmas set, Alexa! I love reading stories at Christmas about hope for a new life through Christ. How you were inspired to wriite the stories for this set is inspiring. Thank you for sharing that!